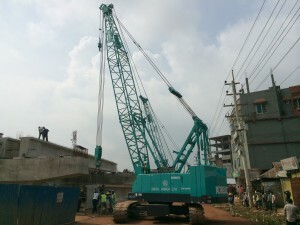 Kobelco Cranes India is making inroads in the Bangladesh infrastructure development sector with the export of two CKL1000i lattice boom crawler cranes to Abdul Monem Ltd (AML) Civil engineering and building specialist AML deployed the cranes at the Jaydebpur-Mymenshing flyover project for the erection of 70t girders in a tandem lift. Both units will continue on this project for four months lifting 125 girders before moving to the Padma Bridge project where 670 girders are to be erected. Kobelco Cranes India, the Indian production and sales subsidiary of Japan-based Kobelco Cranes Co Ltd, said the good number of infrastructure development works ongoing in Bangladesh, together with some mega projects to follow in the coming years, meant the country was a good market for construction equipment. Projects will include power stations, highway construction, railway bridges and a metro system.